Dr. Hayim Iserovich holds a Ph.D. degree from Bar-Ilan University. His research topic was the development of the British counterterrorism doctrine in Northern Ireland between 1968 and 2005 and Israeli doctrine against the Palestinian terror organizations during that same period. Dr. Iserovich got his M.A. in Security Studies (in Excellence) from Tel Aviv University with the thesis "The Egyptian Air Force between East and West". Dr. Iserovich is a journalist with more the ten years of experience in covering world news. Currently, he is the Foreign Affairs Correspondent for the Maariv daily and writing a weekly column about world affairs for the weekend edition of Maariv. His articles cover a wide range of current issues, including politics, security and terrorism around the world. Dr. Iserovich is a member of the International Intelligence History Association. 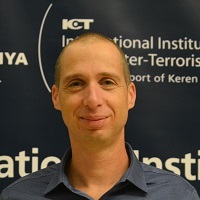 He was an advisory board member for SAFE-COMMS (The Counter-Terrorism Crisis Communication Project), a joint project of Israel and the European Union (2010-2011). He also presented papers during conferences in Israel and abroad.